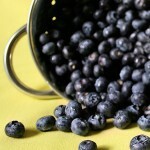 Friday Foodie Fix is here already and looking for your recipes with the Secret Ingredient, Blueberries. Blueberries are becoming known as a super food. They contain cholesterol-lowering compounds, vitamin C, potassium, folate, dietary fiber and is an antioxidant powerhouse. Check out the Blueberry council report stating they have anti-aging effect. I could use that these days. They have been shown to protect against macular degeneration, ovarian cancer, colon cancer and promote gastrointestinal health amoung other things. They are also naturally gluten free and dairy free. Check out World’s Healthiest Foods for more information. Blueberries are one of the few foods that really needs very little preparation to eat. Just rinse immediately before eating or using, drain on a paper towel, then go to town. Use them in muffins, in and on waffles, in smoothies, in ice creams, and even in salads. Blueberries are native to North America and are in season in the Spring and Summer. Here are a couple of my Blueberry recipes. I’d love for you to share yours. 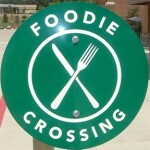 To read up on the rules visit our Friday Foodie Fix page. I hope you will visit all of the great recipes that are showing up below. We love blueberries! Blueberry & Blackberry Crumble Pie and Berrylicious Gluten Free Shake and check out the Gluten Free, Dairy Free, Sugar Free Blueberry Ice Cream for Breakfast. Next week’s Secret Ingredient is …………………….Green Beans! Over the past few years, I've really come to love blueberries. At my daughter's request, we buy them every week. So fast to rinse and give to her in the morning with breakfast. Knew they were good for antioxidants. Glad to know they're good for gastrointestinal health, too. Heather- That is so cool when kids get on the good food bandwagon. I have one of each. Still working on it. Over the past few years, I’ve really come to love blueberries. At my daughter’s request, we buy them every week. So fast to rinse and give to her in the morning with breakfast. Knew they were good for antioxidants. Glad to know they’re good for gastrointestinal health, too. My three kids love blueberries because of its deep, rich color. I love that it's a great healthy snack for them. Am looking forward to trying out the other blueberry recipes featured today. Thanks! Can't wait to see the recipes today too. Love the one you shared. I'll be making that one soon! My three kids love blueberries because of its deep, rich color. I love that it’s a great healthy snack for them. Am looking forward to trying out the other blueberry recipes featured today. Thanks! Can’t wait to see the recipes today too. Love the one you shared. I’ll be making that one soon! I love blueberries! One of my all time favorite foods. Everything looks great! Dianne- Thank you for all the great recipes. I have to say that fudge is evil. I'd do naughty things to get my hands on that. Or I should say it would do bad things to me if I ate it but it might be worth it. It looks so good!!!! Dianne- Thank you for all the great recipes. I have to say that fudge is evil. I’d do naughty things to get my hands on that. Or I should say it would do bad things to me if I ate it but it might be worth it. It looks so good!!!! Celiacs Tips- It's good to be reminded about these little gems of a food. They pack a mean punch that our bodies can use. Let us know how you use blueberries. Thanks for stopping by and commenting! Celiacs Tips- It’s good to be reminded about these little gems of a food. They pack a mean punch that our bodies can use. Let us know how you use blueberries. Thanks for stopping by and commenting! Blueberries are due at the market any time now. Can't wait. We just eat them fresh on salad and cereal and then freeze them for pancakes and muffins in the dark, dreary winter. Wendy- Freeze them, what a great idea. Buy extra at the farmers market and freeze them so you can enjoy them in the off season. I wonder how that costs out compared to the ones in the freezer section at WF. I'll check that out this week. Thanks for the idea! Blueberries are due at the market any time now. Can’t wait. We just eat them fresh on salad and cereal and then freeze them for pancakes and muffins in the dark, dreary winter. Wendy- Freeze them, what a great idea. Buy extra at the farmers market and freeze them so you can enjoy them in the off season. I wonder how that costs out compared to the ones in the freezer section at WF. I’ll check that out this week. Thanks for the idea! Shirley- There are so many great properties to blueberries you owe it to yourself to give it a try. Please let us know if you try them out and how you used them. Oh, and if you liked them or not. Some things can work on their own, and sometimes they need to be hidden just so you can get them into your diet. Do it all the time to my husband. Funny thing, he tries the meals and says it was better than he thought. Or he'll eat something and then ask what was in it. He's learning he likes more foods than he realized. Me too. I never ate very many different types of foods. Now I'm trying all sorts of foods. Maybe soon we'll have a secret ingredient I've never eaten or cooked with. That will be a leap of faith! Shirley- There are so many great properties to blueberries you owe it to yourself to give it a try. Please let us know if you try them out and how you used them. Oh, and if you liked them or not. Some things can work on their own, and sometimes they need to be hidden just so you can get them into your diet. Do it all the time to my husband. Funny thing, he tries the meals and says it was better than he thought. Or he’ll eat something and then ask what was in it. He’s learning he likes more foods than he realized. Me too. I never ate very many different types of foods. Now I’m trying all sorts of foods. Maybe soon we’ll have a secret ingredient I’ve never eaten or cooked with. That will be a leap of faith! I can't believe I don't have any blueberry recipes up on my blog! I will have to work on this since I seem to buy the frozen ones frequently. Alisa- It's funny how you eat certain foods but then you notice they're missing from your recipes. That happens to me often. I'm trying to pick secret ingredient foods that are really good for us and we should eat more of. I need more ideas and it's always wonderful how the community provides options. Take a recipe you found here and play with it. I'd love to see what you create! I can’t believe I don’t have any blueberry recipes up on my blog! I will have to work on this since I seem to buy the frozen ones frequently. Alisa- It’s funny how you eat certain foods but then you notice they’re missing from your recipes. That happens to me often. I’m trying to pick secret ingredient foods that are really good for us and we should eat more of. I need more ideas and it’s always wonderful how the community provides options. Take a recipe you found here and play with it. I’d love to see what you create! I love blueberries!! Unfortunately I couldn't find any organic ones around yet so I couldn't participate this week…All the recipes look delicious though! Jenn- I often forget I live in the land of plenty in NOVA. There are tons of farmers, grocery stores, health food stores and just food everywhere. Feel free to stop back and add in your recipes when the blueberries hit your market. They will always be accessible through the page on the navigation bar for Friday Foodie Fix. I love blueberries!! Unfortunately I couldn’t find any organic ones around yet so I couldn’t participate this week…All the recipes look delicious though! OOh, I had a great recipe idea but I've been sick and never got to perfect it. 🙁 We are blessed to have a neighbor with an enormous blueberry patch! All of your ideas look delicious, I'll have to try them out. Jessie- Sorry to hear you've been sick. I hope you are feeling better now. Grab some of those blueberries off your neighbors and eat up. Blueberries are full of antioxidants. I hope you will come back and add in your recipe. You can always find the link at the top navigation bar for Friday Foodie Fix. Feel well. OOh, I had a great recipe idea but I’ve been sick and never got to perfect it. 🙁 We are blessed to have a neighbor with an enormous blueberry patch! All of your ideas look delicious, I’ll have to try them out. Jessie- Sorry to hear you’ve been sick. I hope you are feeling better now. Grab some of those blueberries off your neighbors and eat up. Blueberries are full of antioxidants. I hope you will come back and add in your recipe. You can always find the link at the top navigation bar for Friday Foodie Fix. Feel well. Hi Diane – I just learned about your Foodie Fix today – better late than never, huh? Love your blueberry ice cream story. I have had some follies with my ice cream maker, too. I use a KitchenAid and one night I decided that I needed to oil it so I got out the WD-40 and gave it a good spray. Needless to say it stopped working, and is still out of comission. My husband went out the next morning and bought me a new one. We can't be without our homemade ice cream. Amy- What a good guy to go get you a new ice cream maker. He must love what you make. I'm almost done with the blueberry and it will be time to make something new. I'm resisting the urge to make chocolate and make a combo for breakfast. Well, maybe chocolate for breakfast with some other goodies. So glad you found The W.H.O.L.E. Gang! Hi Diane – I just learned about your Foodie Fix today – better late than never, huh? Love your blueberry ice cream story. I have had some follies with my ice cream maker, too. I use a KitchenAid and one night I decided that I needed to oil it so I got out the WD-40 and gave it a good spray. Needless to say it stopped working, and is still out of comission. My husband went out the next morning and bought me a new one. We can’t be without our homemade ice cream. Amy- What a good guy to go get you a new ice cream maker. He must love what you make. I’m almost done with the blueberry and it will be time to make something new. I’m resisting the urge to make chocolate and make a combo for breakfast. Well, maybe chocolate for breakfast with some other goodies. So glad you found The W.H.O.L.E. Gang! Just added a recipe, finally….I usually don'thave posts ready when Friday comes around. In time I will. I love what you are doing here! Just added a recipe, finally….I usually don’thave posts ready when Friday comes around. In time I will. I love what you are doing here!